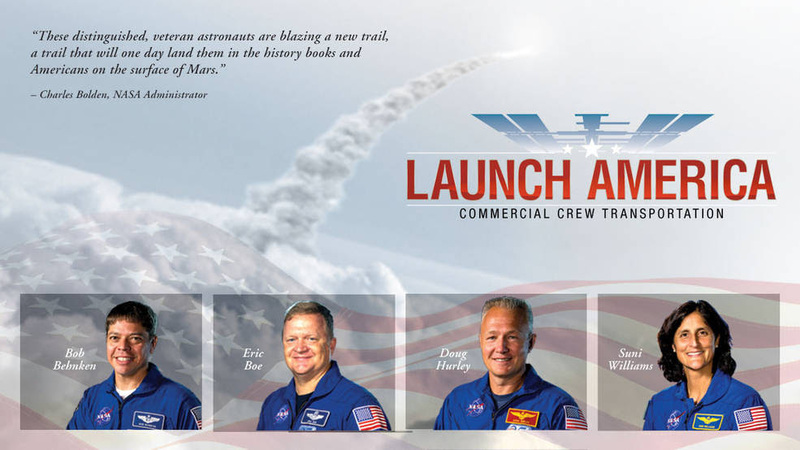 July 9, 2015 – NASA has selected four astronauts to train and prepare for commercial spaceflights that will return American launches to U.S. soil and further open up low-Earth orbit transportation to the private sector. The selections are the latest major milestone in the Obama Administration’s plan to partner with U.S. industry to transport astronauts to space and end the nation’s sole reliance on Russia for space travel. NASA named experienced astronauts and test pilots Robert Behnken, Eric Boe, Douglas Hurley and Sunita Williams to work closely with The Boeing Company and SpaceX to develop their crew transportation systems and provide crew transportation services to and from the International Space Station (ISS). 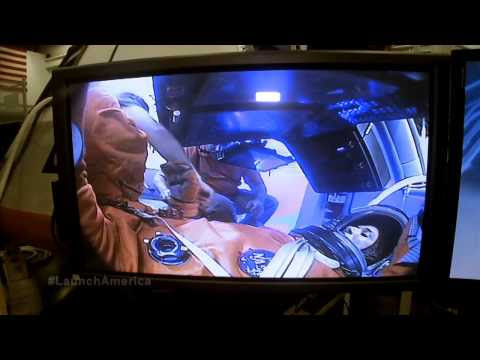 The commercial crew astronauts will work closely with company-led teams to understand their designs and operations as they finalize their Boeing CST-100 and SpaceX Crew Dragon spacecraft and operational strategies in support of their crewed flight tests and certification activities as part of their contracts with NASA. The Commercial Crew Transportation Capability (CCtCap) contracts with Boeing and SpaceX each require at least one crewed flight test with at least one NASA astronaut on board to verify the fully-integrated rocket and spacecraft system can launch, maneuver in orbit, and dock to the space station, as well as validate all systems perform as expected, and land safely. To meet this requirement, the companies also must provide the necessary training for the crew to operate their respective vehicles. NASA is extensively involved with the companies and reviews their training plans. Once the test program is completed successfully, and the systems are certified by NASA, the companies will conduct between two and six crew rotation missions to the space station. Each mission will transport four NASA crew members and at least 220.5 pounds of pressurized cargo to and from the orbiting laboratory. The Boeing CST-100 will be launched on a United Launch Alliance (ULA) Atlas V rocket. Workers are currently constructing the new crew access tower for Space Launch Complex 41 at Cape Canaveral Air Force Station in Florida. Boeing and United Launch Alliance are building the tower so astronauts and ground support teams can access the CST-100 spacecraft for missions to the International Space Station. The first commercial crew mission is expected to launch in late 2017, but its unclear how Congressional funding cuts to the commercial crew program could affect that timeline. Robert Behnken is a U.S. Air Force colonel from St. Anne, Missouri, who accumulated more than 1,300 flight hours in more than 25 different aircraft types. NASA selected Behnken as an astronaut in July 2000, and he reported for training in August 2000. Behnken flew on space shuttle missions STS-123 in March 2008 and STS-130 in February 2010, logging more than 29 days in space, including more than 37 hours during six spacewalks. He earned bachelor’s degrees in physics and mechanical engineering from Washington University in 1992, and a master’s and doctoral degree in mechanical engineering from the California Institute of Technology in 1993 and 1997, respectively. Behnken has served as chief of the Astronaut Office since 2012. U.S. Navy Capt. Chris Cassidy is replacing Behnken as chief of the Astronaut Office. Eric Boe, also a U.S. Air Force colonel, was born in Miami and grew up in Atlanta. As an Air Force pilot, he flew more than 5,000 hours in more than 45 different aircraft before NASA selected him as an astronaut in July 2000. A veteran of two spaceflights, STS-126 in November 2008 and STS-133 in February of 2011, Boe has spent more than 28 days in space. While in the Astronaut Office, Boe’s technical assignments included serving as the NASA director of operations at the Gagarin Cosmonaut Training Center in Star City, Russia, and as the deputy chief of the Astronaut Office. He earned a Bachelor of Science in astronautical engineering from the U.S. Air Force Academy in 1987 and a Master of Science in electrical engineering from the Georgia Institute of Technology in 1997. Douglas Hurley, a retired U.S. Marine colonel, was born in Endicott, New York, and considers Apalachin, New York, his hometown. Hurley retired from the military in 2012 after more than 24 years of service as a Naval aviator who flew more than 4,500 hours in more than 25 different types of aircraft. He also was selected as an astronaut in 2000, and spent more than 28 days in space, flying as the pilot of STS-127 in July 2009 and STS-135 in July 2011, the last flight of the Space Shuttle Program. Hurley served in several technical assignments within the Astronaut Office including as the NASA director of operations at the Gagarin Cosmonaut Training Center in Star City, Russia. His most recent assignment was as the assistant director of New Programs for the Flight Operations Directorate at Johnson. He graduated with a Bachelor of Science in civil engineering from Tulane University in New Orleans in 1988. Sunita Williams, a U.S. Navy captain, was born in Euclid, Ohio, and considers Needham, Massachusetts, her hometown. Williams received her commission in the Navy in May 1987 and became a helicopter pilot, logging more than 3,000 flight hours in more than 30 different aircraft. NASA chose Williams for the astronaut program in 1998. A veteran of two long-duration spaceflights, Williams spent a total of 322 days in space and currently holds the record for total cumulative spacewalk time by a female astronaut (50 hours and 40 minutes). She now ranks sixth on the all-time U.S. endurance list, and second all-time for a female astronaut. She graduated from the U.S. Naval Academy in 1987 with a bachelor of science in physical science, and from the Florida Institute of Technology in 1995 with a master of science in engineering management.